Successfully Added POPTEL P60 IP68 Mobile Phone - MTK6763, 6GB RAM 128GB ROM, 5.7 Inch Screen, Wireless Charge - Orange to your Shopping Cart. Driven by the advanced MTK6763 processor and runs on Android 8.1 OS, support face ID, OTG, GPRS, GPS, OTA, Bluetooth 4.0 etc. Equipped with 6GB RAM and 128GB ROM, couple with external memory(MAX 128GB, not included), provides enough room for storing data, files, videos etc. With 5000mAh battery which supports the wireless charge, offers enough power and convenient to charge. 13MP+5MP dual rear cameras and 8MP front camera, three cameras design, let you capture clear and vivid pictures. Waterproof up to 1.2 meters for 30 minutes, IP68 waterproof & dustproof, Wel-finger compatible. Powered by a customized operating system based on Android 8.1 with an intelligent interface, powerful private system and new visual experiences, the P60 brings you a faster, safer and more user-friendly experience. Have an exclusive intelligent algorithm to scan your facial features and unlocks instantaneously, the P60 consumes low memory and power, and guarantees a safer and more smooth operation. Poptel P60 offers dual-LTE/VoLTE with global 31 frequency bands, providing wider signal coverage and more stable signal to ensure you always stay connected. Powered by Helio P23 and clocked at 2.0GHz 16nm octa-core processor, with the intelligent customized system, P60 delivers amazing speed and performance for all-day entertainment and fast multi-tasking while preventing overheating and consuming 60% less power. Carrying the improved LPDDR4 mobile memory technology, with Samsung 128GB ROM and 6GB RAM. By inserting an extra MicroSD card, you will get up to 128GB of expandable storage - enough for about 32000 photos - to relieve all your adventures. The P60 uses two rear cameras - a 5MP secondary camera and a 13MP main camera with Samsung 3P3 Sensor. With AI photographing mode, P60 helps you to shoot breathtaking photos, also can film slow motion in Full HD resolution. There is a function button on the right for instant gloves-on access to the camera. With intelligent photograph algorithms, P60 can automatically adjust your camera to help you take smart selfies with 8MP camera and multiple modes. The multiple templates for FaceCute mode will help you shoot cute selfies. Features a 5.7" bigger screen with ultra-wide visual field and advanced display technology, the P60 delivers exceptional contrast color and clarity with an FHD+ resolution(2160*1080 pixels). 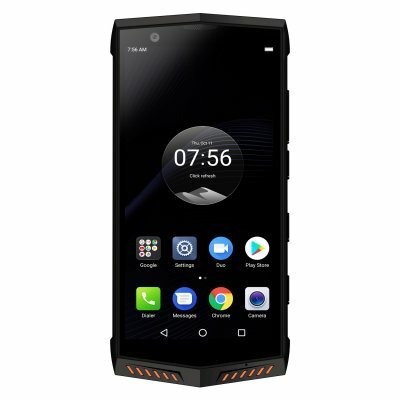 After installing the Zello and customizing the function button on the right of the P60, then you get PTT button to use it as a walkie-talkie and connect with people anywhere, also you can fire up the Zello without having unlocked the phone. Built-in NFC and back fingerprint scanner module with Google Pay support, P60 will provide you an easier, safer and faster in wireless connection and secure purchase in local stores, apps and online. Reinforced with a durable metal frame, plastic corner edges, strengthened suspending border, top protective texture back design, the Poptel P60is engineered with military-grade durability to withstand the toughest hits and falls. The standard testing including: temperature and environmental extremes, pressure, vibration, and shock, as well as salt fog, sand, dust, and water immersion etc.